But as the Bulls prepare to open the preseason Tuesday at the United Center against the Memphis Grizzlies, Deng is coming in without the rehabilitating Derrick Rose as arguably the most impressive player in training camp and the veteran leader of this latest new Bulls team. The consensus among several players and coaches after the first week of training camp is they’ve never seen Deng playing at such a high level, both shooting the ball well and going effortlessly off the dribble in addition to his fine defense. While Deng isn’t, as usual, a particularly vocal leader–Richard Hamilton has tried to assume that role with several talks to the team–Deng has proved inspirational with his relentless play and effort. And it seems appropriate as Deng is officially entering the status as one of the all-time Bulls franchise greats. There have been difficult times, like the stress fracture that kept him out of the 2009 playoffs and resulting declines in production which had many questioning his value to the team. 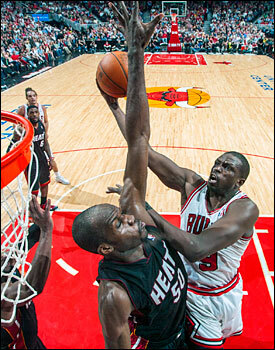 But now entering his ninth season with the Bulls, Deng has become one of the franchise’s top players. Only Michael Jordan, Scottie Pippen, Jerry Sloan, Bob Love, John Paxson and Tom Boerwinkle played with the Bulls longer than Deng. Deng ranks seventh all-time in franchise points scored, sixth in steals and 10th in rebounds. He is one of 14 players in franchise history to make an All-Star team. And without Rose for at least half the season, Deng is most likely to emerge as the player the Bulls will look toward for leadership and aplomb in stressful times. It’s an important message for the Bulls with Rose’s absence, and Deng is delivering it with his play and competitiveness already. If you don’t let down, don’t allow others to dictate who you are, well, anything is possible. It will be a vital lesson to remember for this Bulls team early in the season. Players and coaches say it’s been a productive training camp thus far, basically free of injuries with a lot of attention to working in the new additions. They’ll likely get a good workout in the opening preseason game with a test for the new bench mob in an attempt to begin developing the chemistry the group had particularly last season. It is probably too much to ask so soon as the reserves evolved over the last two seasons. Joakim Noah had to leave the team for personal reasons. So Nazr Mohammed probably will start at center with the other regulars with Kirk Hinrich at point guard. But figure on considerable substitutions. Likewise with Memphis, which opened its preseason Saturday with a home game against Real Madrid and Bulls draft pick Nikola Mirotic. The Grizzlies worked hard to win that game, even bringing back their starters when Real Madrid closed in the last five minutes. With 18 players on the roster, Memphis likely will take a look at several players trying to make their team. So for the Bulls it also should be more of a light test and a chance to look at different combinations and some of the new players. But it’s the most veteran of the Bulls, at least in tenure with the franchise, who will be in that leadership role. That seemed uncertain coming off last season’s playoff disappointment, Deng’s lingering wrist issue and several teams trying to pry Deng away from the Bulls with high draft picks. Even with the uncertainty over whether he’d have surgery the offers remained in a testament to the increasing regard for Deng around the NBA. But with that nettlesome wrist problem, there was debate about whether Deng should risk aggravating it in the Olympics playing for Great Britain. Deng was resolute given that his family settled in England to escape the Sudan civil war. “I wanted to play in the Olympics,” Deng said. “Really wanted to do that. The wrist during the year kept getting better and stronger. I started to realize I could get better (without surgery). And the irony may be that playing in the Olympics may be making Deng a better player. He’s said around the team that playing in the Olympics has helped his timing and keeping him basketball ready more so than in previous off seasons. Deng has combined that with a rigorous program of stretch yoga that has him more flexible and unrestricted than perhaps any time in his pro career. And the one constant in all that now is Luol Deng.